June 14, 2018 - Engineering News - ROUTES has called on airlines and airports to work together to stop widespread wildlife trafficking. “Wildlife trafficking is a global challenge. 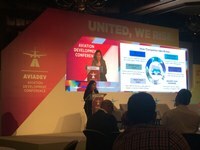 The very existence of wildlife is being threatened,” WWF private sector engagement team director Afsoon Namini, told delegates at the AviaDev conference, in Cape Town, this week. Namini said transport routes between Africa and Asia were particularly fraught with illegal trafficking of everything from rhino horn to reptiles and birds. Illegal trafficking of wildlife was also linked to other crime. The WWF director outlined the scale and impact of illegal wildlife trafficking. Namini, who travelled from the US to give her presentation to the conference, called on companies to train staff to safely detect and respond to instances of wildlife trafficking. She suggested airports and airlines have a whistleblower policy so that people aren’t afraid or wary of reporting incidents. She said airlines should share their success stories with customers and raise awareness of trafficking. Namini said airlines should incorporate counter wildlife trafficking policies and advocate among their peers and supply chains. The WWF is a key partner in the Reducing Opportunities for Unlawful Transport of Endangered Species (ROUTES) partnership funded by USAID. The partnerships bring together government agencies, companies in the logistics industry and international conservation, development and law enforcement organisations, and donors, in a bid to disrupt wildlife trafficking. Wildlife traffickers exploit the increasing connectivity of global transportation, online markets and gaps in law enforcement to traffic live and dead animals and products. Namini explained that ROUTES worked to disrupt wildlife trafficking along transportation supply chains through improved data analytics, engaging corporate leaders, training transport personal, strengthening policies and increasing client awareness.